I loved this challenge so much I had to do it twice!! This time I made an adorable little butterfly card for my girlfriends daughter!! 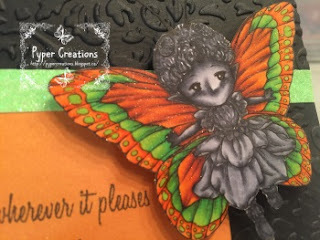 Aurora Wings- Butterfly Sprite w/ Intricate Wings turned into a black, orange and green birthday card!! I love the way that it turned out!! 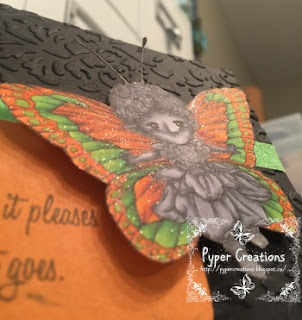 I used a CTMH Sentiment stamps and just some random peices around the craft room to make this CAS card for you! 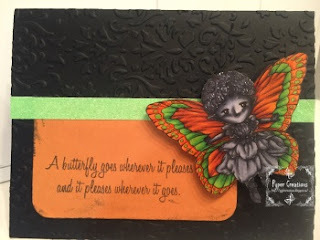 I really wanted you to see you could use this Challenge Theme for something besides Fall or Halloween images!! I do hope you will come play with us at The Aurora Wings Challenge Blog!! The green with the orange is perfect! 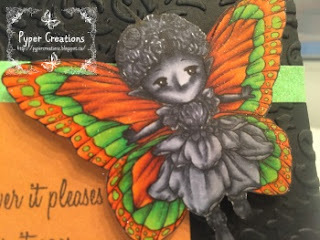 I love this card, Sara!